Oatmeal muffins are by far the #1 thing Vishnu asks for that I make on a regular basis. We can’t get enough! Sometimes we eat them for breakfast, sometimes they serve as a snack, and on nights where nothing else sounds good, they are dinner. And if you aren’t convinced, my sister, my parents, and many of our friends love them as well! As far as taste and texture are concerned, they don’t taste like oatmeal – they’re doughy with slightly crispy edges (if that makes any sense). The maple syrup adds a hint of sweetness and richness, the melted dark chocolate chips are just perfection, and the walnuts add a nice crunch. I can’t claim credit for these delicious bites. 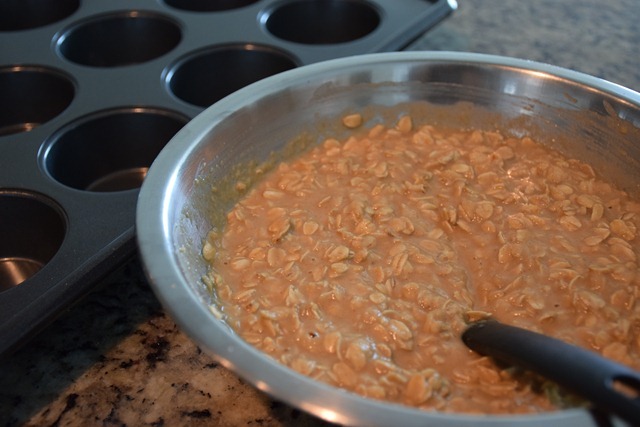 I first learned about baked oatmeal on Katie’s blog, but because I didn’t have an oven safe bowl to make one big portion, I split the batter among individual muffin cups. Works like a charm! I highly suggest you follow in my footsteps and make these on a Sunday, double the recipe, and enjoy throughout the week. One pan is NEVER enough for the two of us…NEVER! 2. Whisk together almond milk, applesauce, vanilla extract, maple syrup, cinnamon, and salt. 3. Add peanut butter one spoonful at a time whisking as you go. 4. Add walnuts and oats and fold until everything is evenly incorporated. 5. Divide mixture evenly between a greased 12 cup muffin pan (~1/8 cup per muffin). 6. Add 4 dark chocolate chips to each muffin (I know this is super specific but trust me it’s the perfect amount). 7. 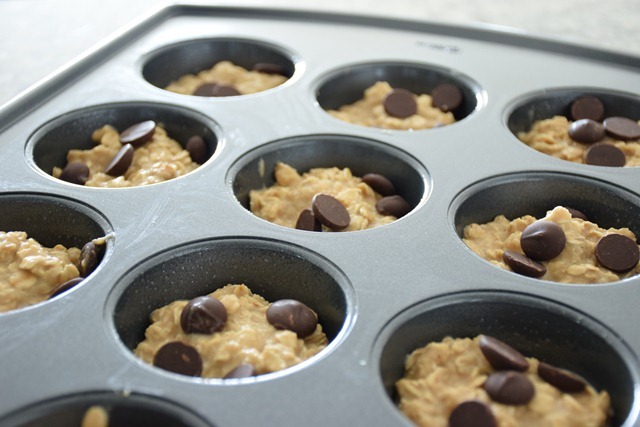 With a small spoon, fold chocolate chips into each muffin cup. 8. Bake for 25 minutes until muffins are golden brown. 9. Allow to cool for 10 minutes and enjoy! Vishnu loves these cold (like straight out of the refrigerator), and I love them warm (my favorite is straight out of the oven). Regardless how you eat them, I can 100% guarantee that even the pickiest eater will enjoy these muffins. What is the one thing you find yourself making week in and week out? It’s very eye opening. Did you end up taking it? Mmmm these look absolutely delish, P! I’m on a baked oatmeal kick too lately. For the last few weeks, I’ve been making a batch of baked banana oatmeal muffins for breakfast during the week. They taste almost too indulgent (and fancy) for a regular weekday breakfast- not that I mind :-)! Looking forward to trying your recipe soon! Ah, how I love things that can double as breakfast or dessert 🙂 P.S. “Heaping” is the only way to have a tablespoon of peanut butter! Baked oatmeal would be my kind of muffin, too, and such a great no-fuss-prep snack to have at hand. Though I especially like this: “on nights where nothing else sounds good, they are dinner”. That’s the best kind of recipe. I’m not really into food prep but seeing as I’ve been going for plain rolled oats with soy milk lately in anway – why not keep some baked at hand? Miss Polkadot recently posted…Roast, bake, blend and eat. 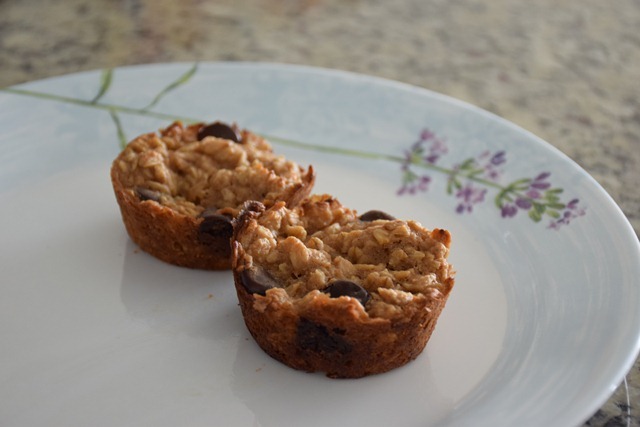 Love love love baked oatmeal – in muffin form it -with chocolate chips it sounds fantastic!!! Have a lovely weekend Parita! I love the texture of ground up oats in baked goods! You must make them soon! I guarantee they will be a huge hit in your house! These look and sound delicious! I love chocolate with oatmeal!